After all this fuss that's been made about sugar, it turns out that it might be that other granular white stuff that's actually killing you. I'm talkin' sneeze, table snow, white pony, baby. I'm talkin' salt. 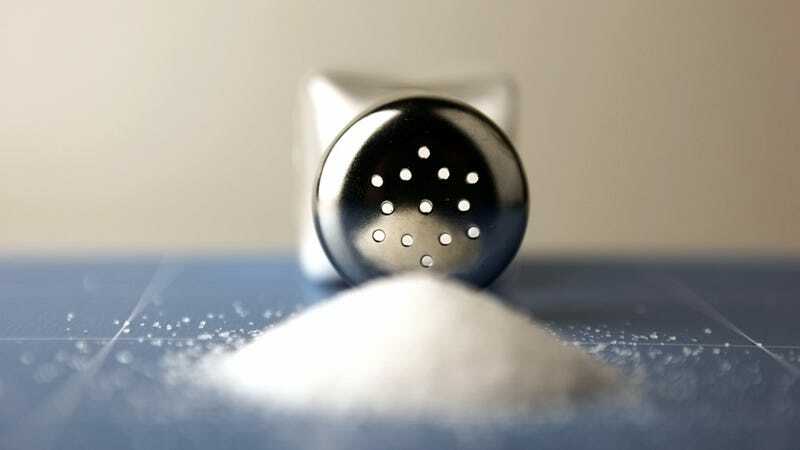 A new study by the Harvard School of Public Health claims that excessive salt consumption contributed to almost 2.3 million cardiovascular deaths (worldwide) in 2010 and that 1 in every 10 deaths in the U.S. can be linked to salt. "The burden of sodium is much higher than the burden of sugar-sweetened beverages. That's because sugar-sweetened beverages are just one type of food that people can avoid, whereas sodium is in everything." Dr. Dariush Mozaffarian claims that part of the problem is that sodium is so pervasive in pre-made foods and that the only real way to avoid eating too much salt is to make all of your own meals from scratch — a time luxury that most Americans don't have. "It's really amazing how pervasive it is," he said. "For the average person, it's very hard to avoid salt — you have to be incredibly motivated, incredibly educated, have access to a range of foods and do all the cooking yourself." This isn't just an elderly person's problem either: "From that we could determine the health effects of sodium, it's really affecting younger adults, not just the elderly," says Dr. Mozaffarian. 1 in 3 salt related deaths occurred in people under the age of 70. "This misleading study did not measure any actual cardiovascular deaths related to salt intake, since, by the authors' own admission, no country anywhere in the world consumes the low levels of salt they recommend...The Salt Institute does not consider this misleading modeling exercise helpful in furthering our knowledge of the role of salt on our health. On the contrary, it is disingenuous and disrespectful of consumers." So much for the salata days. Image via Nenov Brothers Images/Shutterstock.